I am so pleased to share this book – it represents a year of my own involvement plus a year or two of defining the project and soliciting chapters (by the other editors, before I came on board). 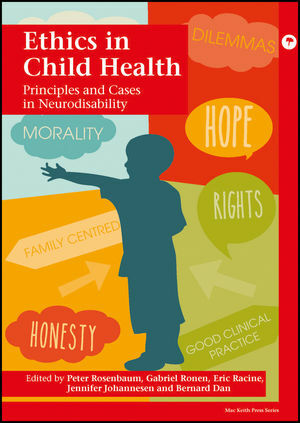 The book is a collection of articles submitted by professionals in neurodisability – physicians, medical specialists, nurses, social workers – health care providers of all stripes. Many countries are represented, as are a variety of disabilities and diagnoses, family constellations, approaches to ethical issues and applications of ethical frameworks. The themes of the essays centre around ‘everyday’ ethical dilemmas. Chapter authors share accounts of clinical encounters with families and patients that lead them to consider the ethical dimensions of their work, from macro and micro perspectives. Each author or group of authors then offers their own interpretation of their experience through an ethics framework lens, providing the reader with an expanded understanding of the complexity of clinical work, and ideas for resolution of challenging or complex situations. The project was led by the inimitable Dr. Peter Rosenbaum and Dr. Gabriel Ronen at CanChild and McMaster University – renowned educators and researchers in childhood disability and developmental medicine. Also on the editorial team is Éric Racine (Director of the Neuroethics Research Unit, Associate Research Professor and Associate Director, Academic Affairs of the Institut de recherches cliniques de Montréal, Quebec, Canada) and Dr. Bernard Dan (Professor of Neurophysiology and Developmental Neurology at the Université libre de Bruxelles (ULB), and Director of Rehabilitation at Inkendaal Rehabilitation Hospital, Belgium). I am co-editor of the book, and I wrote an introductory chapter. Download book overview and chapter descriptions here.